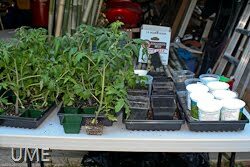 My tomato plants often grow out of control under shop lights because I start them too early, I’m not ready to plant, or the weather isn’t right. Some years I just deal with these gangly plants growing in too-small containers. Other years I manage to get off the couch and pot them up into larger containers. I’m always rewarded with better tomato crops. Here are my 15″-18″ plants in 3″X3″ containers. You can see the dense root system crying out for more space. 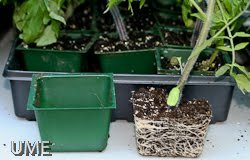 I mixed some fertilizer into the soilless mix before potting up into large yogurt containers and 5″X5″X5″ pots. The plants have been happily living on my porch except during the coldest nights, and can continue to grow where they are until I can get them in the ground. I’m thinking of using black plastic mulch this year because I’m tired of waiting so long for tomatoes! I haven't used black plastic as a mulch. Do you recommend the typical “landscaping fabric” or something else? And since tomatoes are subject to quite a variety of diseases, do you discard the mulch after one year or reuse it? I use the 1.5 mil black plastic that comes in 3 ft. or 4 ft. wide rolls. You can't take it up at the end of the season to reuse- that's the downside. In the past I've used landscape fabric for pepper, eggplant, and tomato. It probably does not heat the soil as well as black plastic but works nicely and can be reused. Good question about disease carryover on landscape fabric. I can't say for sure but my guess is that it would not be a problem. RED plastic mulch for tomatoes. The 'science' behind it is very appealing. Or is it just marketing? Will be be seeing chartreuse mulch in the catalogs next year?? Colored plastic mulches have been used by commercial growers for many years. Black plastic mulch is very popular for warming soil and preventing weeds. Other colors have been used to confuse/repel certain insect pests. I have not used the red plastic mulch. I remember seeing research results from SC several years ago that showed modest increases in tomato yields. I don't see commercial growers using it in MD. If you're curious you might want to compare red and black plastic mulches in your garden.